Well, I'm going to keep working on it; but, I've not figured it out yet. I'm sure that the ZI_GetZoomValue is part of the equation; but, I'm stumped. Patrice, do you mind sharing how the ZI_GetCropCoordinates API gains it's information? I feel like I should be getting this; but, I'm not. On another note (and still using the zoomplus.bas example), if I added a sprite above Monaco, would it be possible that once zoomed in we could automatically center the sprite and the background image would still scroll with it using ZD_SetObjectScroll? Any similar examples or should I start tinkering? Note: X1, Y1 are the mouse coordinates and hWnd is the handle of the GDImage control. ZoomWidth& = nW& * ZoomValue! ZoomHeight& = nH& * ZoomValue! x1& = (x1& - xOffset&) / ZoomValue! y1& = (y1& - yOffset&) / ZoomValue! imgWidth& = imgWidth& / ZoomValue! imgHeight& = imgHeight& / ZoomValue! For your other question you can always change the location of a sprite at any time. The ZI_GetXscroll and ZI_GetYscroll API give you the horizontal and vertical scroll range for a specific GDImage control. Here is a WinDev procedure that is being used to display the mouse coordinates in a GDImage ZOOM control. It displays a map(s) with pushpin sprites spread on it. Each pushpin is a hot spot that does match a specific tunnel (Try with the one named "l'Arme" located above Monaco). 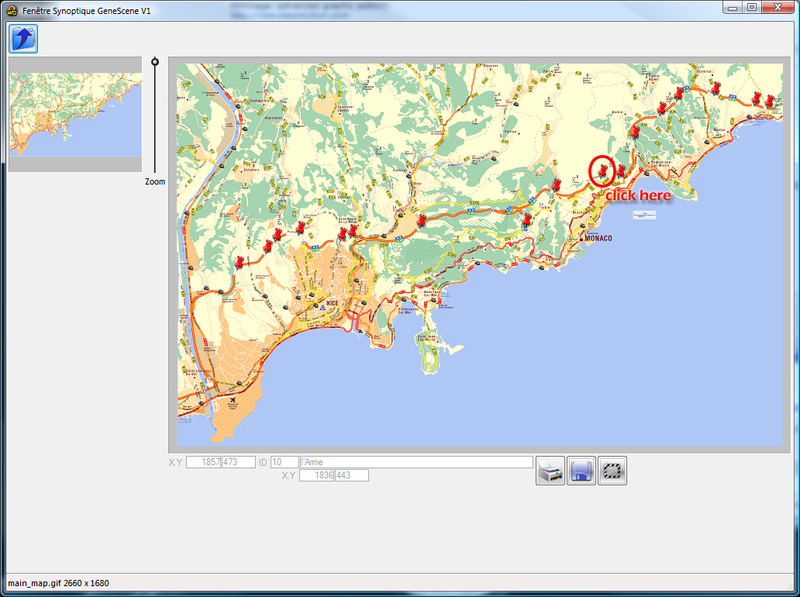 You will see also on this example that the mouse X,Y location is shown below the map while you are moving the mouse, and it display the correct location whatever the zoom being used. Perhaps it is something like that you want to achieve? This is perfect! For whatever reason, I'm not able to replicate that functionality when I'm zoomed in. I must be letting something slide somewhere. GDImage allows you to process/monitor all the messages of its graphic controls via a callback procedure. Note: in the GeneScene project all the pushpins (except one) are clone objects, this is a very unique GDImage feature. I was handling the current scroll in the wrong spot. The WinDev post though nearly the same as the PB showed me where I was screwing up. I was so sure that some of my own code was accurate I was blinded to the truth. I've attached the zoomplus sample with my changes in case anyone else is interested. The output information is sent as a debug string. I capture those with DebugView. ...that while checking each of the values they seem to be fine. Unfortunately, the image control doesn't show the changed %ZI_Horizontal and %ZI_Vertical settings, instead they show the default zero. I tossed in a redraw for fun and still don't see anything. Anything I might be overlooking? Also, I can see from ZD_GetObjectQuality that you can change the rendering quality. Is it possible to have no adjustment at all when zooming and such? I'd like to see pixels and all without any interpolation. If you want to have full control on your image, then use it as a sprite object (a layer floating above the background, like in PhotoShop). See on this forum the PhotoSetup demo project. Then you have a bunch of properties you can apply to your sprite, see all the API prefixed with ZD_SetOblect... and ZD_GetObject... in the GDImage.inc file (the include file is more accurate than the CHM help file). I can't remember exactly what you want to achieve, because i lost a part of my latest e-mails during the blown up of my notebook, that occured 9 days ago. Here is a WinDev example showing how to assign a GDImage sprite array. WD : is PB (). WD : is PB . the ZD_GetObjectProperties API allows you to retrieve all the properties of a sprite object in one single call. ZD_GetObjectProperties(ID, zItem) '// Retrieves all the details about a GDImage sprite object in one single step. See the code below in red. Note: ZD_FillRect draw a rectangle onto the provided DC using a 24-bit RGB color. If you want to draw a rectangle with an ARGB color (alpha channel), then use ZD_DrawRectangleToCtrl. I would rather manipulate GDImage sprite objects (multiple layers) than drawing using a DC. Drawing using a DC = static image, GDImage sprite objects = dynamic image (you can change the location, z-order, and all parameters of each object). The ZD_FillRect example above will only draw over the background image. If there is no background image loaded (ie the CONTROL ADD specified "" as the image name) or the image is smaller than the control, ZD_FillRect only draws over the image, or not at all (if there is no image). I know I can create a sprite overlay, but all I want is to set a background colour for the image area before I load the background bitmap (has to happen later). Also tried ZI_PaintBrushBitmap, but it has been deprecated (help file needs updating). And of course using an image for background (that could be resized on the fly to match the control size). See all details in the Resource.bas example.